Lot 10 unveiled the exciting future of the iconic mall today to members of the media in an exclusive sneak peek into the new and upcoming incarnation of the green cornerstone landmark of Bukit Bintang. The preview showcased the comprehensive plans to transform the mall and the media representatives also had a taste of the new experiences offered, including the unveiling of Lot 10’s new mascot. To experience first-hand some of the changes, the members of the media were taken on an insightful tour around the mall, led by Joseph Yeoh, Vice President of YTL Land & Development and YTL Hotels & Properties. 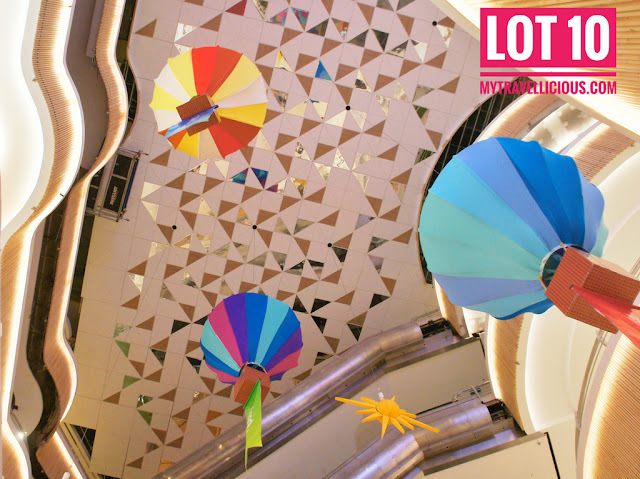 “Since its opening in 1990, Lot 10 has become the icon of Jalan Bukit Bintang. In the early 2000s, Lot 10 catalysed the development of Bintang Walk, raising land value and establishing the prestige of Bukit Bintang as Kuala Lumpur’s most famous shopping street. Now the retail industry in Malaysia is facing challenges with an oversupply of new cookie-cutter malls and fast changes in consumer demand trends, especially in the current digital era. As such, we started embarking on a transformation to align our hardware and software developments with the new vision of Lot 10 – a dynamic retail destination for youthful consumers with a trendy digital environment that excites, entertains and engages. 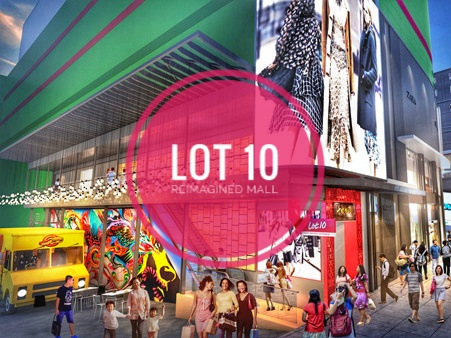 It is no longer good enough to be just a mall; Lot 10 must become a social destination of choice,” said Joseph. The rejuvenation of Lot 10 is anchored on four key drivers – Youthful, Fun, Creative and Connected. The mall’s new target audience are tech-savvy Youthful consumers – Generation Y, millennials and the young at heart – who are shaping the future of retail. Collaborating with tenants and event partners, Lot 10 aims to bring Fun back in a trendy, interactive environment that encourages play and entertainment. 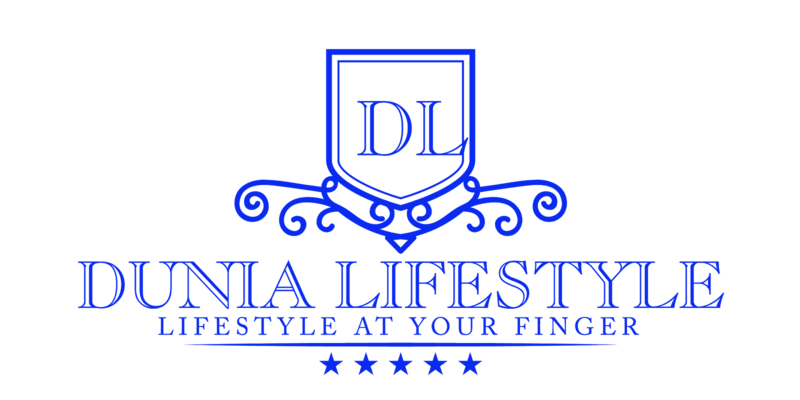 It embraces and celebrates everything Creative, offering platforms for events and activities that facilitate the talents of passionate individuals with free flowing and creative expressions – from art and design to music and dance. To stay Connected, the reimagined space will be an inclusive social space celebrating diversity and encouraging all to meet, gather and connect. 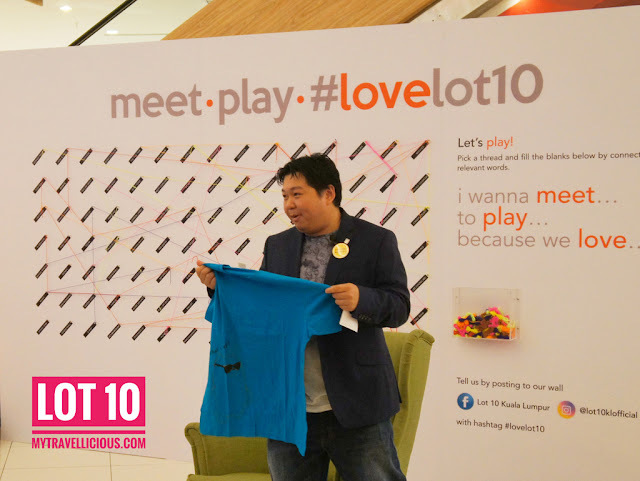 To embody the four key drivers, Lot 10 also unveiled the refreshed Lot 10 logo in ten vibrant colours, accompanied by a brand new Lot 10 tagline – “MEET.PLAY.#LOVELOT10”. “We believe our four key drivers and our new tagline represent not just what we aspire to be but also what our customers want us to be. Brick-and-mortar malls may have lost some of their widespread appeal over the decades; thus, we need to step up to a whole new level to attract and retain the interest of today’s savvy and sophisticated customers. We want Lot 10 to be a social destination to meet and connect, a place where customers not just shop and eat but also play and be entertained. Everyone who walks through our doors must feel the creativity, the fun, the connectivity, the youthfulness and ultimately, the positive energy of love, long after they leave us. Retail is all about emotions and such emotional experiences in Lot 10 are priceless. It is something online shopping cannot offer,” added Joseph. Lot 10 has already completed numerous physical transformations – a remodelling of the interior ceiling with a design inspired by sunlight piercing through a treetop canopy; a new hoisting system that allows creative moving décor pieces to hang down the central atrium; a recently refurbished ground floor atrium with brand new wood panelling and lighting; a revamped drop-off entrance right next to the monorail station welcoming shoppers with giant “Meet”, “Play” and “Love” sculptures and the new main entrance with colour-changing smart LED lights. Extensive transformation works will continue upwards floor by floor, including the installation of new escalators, new lifts, redesigned car parks and new colourful signage to show the way on all floors. To reinforce the element of “Play”, new Play Walls with interactive activities for shoppers to have fun will be set up on every floor, such as a rock climbing wall on the sports floor. Another exciting addition to the Lot 10 facade that faces the upcoming MRT station on Jalan Bukit Bintang was also announced. A brand new entry point to the mall will be built with a set of new escalators leading from the street level to Level 1 shops, offering a shortcut for customers on the go and a strategic entrance to capture increased traffic when the new MRT station opens. 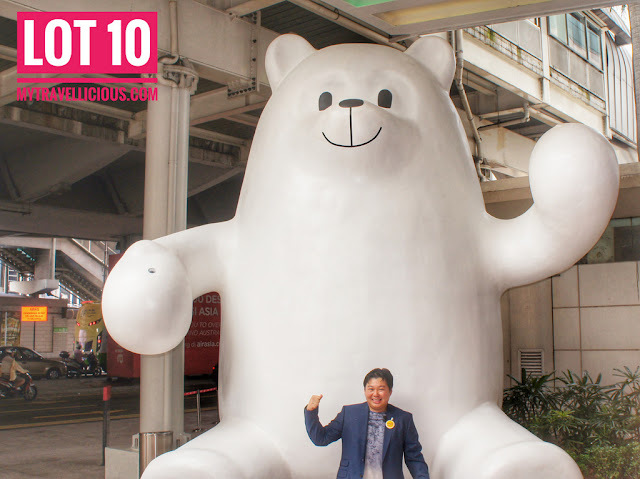 Meanwhile, Lot 10’s new-born mascot – a white 4-metre tall bear named Lottie, was also unveiled with much fanfare by Joseph in the presence of media friends right next to the newly revamped main entrance. Personifying the fun, playful and youthful energy of Lot 10, Lottie loves shopping, eating, playing games, hanging out with friends and taking selfies. Lottie will take on different looks at different times of the year; it is a definite top 10 Instagrammable moment at Lot 10 for everyone. Joseph also shared plans for a brand new store selling irresistible merchandise featuring Lottie for shoppers to bring home, such as limited-edition T-shirts, caps, bags and more. In the pipeline are plans to rope in young designers and artists to design limited-edition products, which will also involve the public in voting for their favourite designs for production. To promote creativity and encourage the public to contribute towards shaping the experience in the mall, Lot 10 plans to collaborate with arts and design schools such as Raffles College to creatively design spaces in the mall as well as exhibit creations and artworks by young designers. It also intends to serve as the space where youthful communities gather not just to socialise but also to further their shared passions. Seeking to establish this creative platform, the mall wants to connect with youthful consumers in fun and playful activities and events that allow them to sing, dance, paint, act, play, testbed ideas or even sell their own creations in pop-up stores. 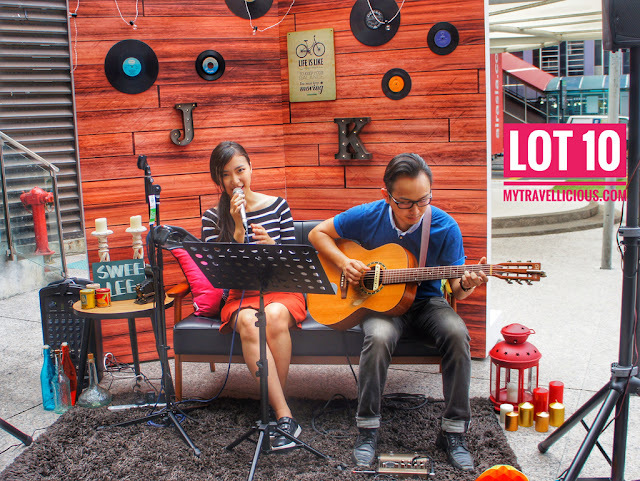 There will also be outdoor areas designated for buskers to showcase their talents. Lot 10 aims to be the hub for music, art, dance, busking, sports and young entrepreneur communities to grow. To help shoppers further shape their own memorable experiences, the all-new Lot 10 Cheerleader Squad, comprising young and hip brand ambassadors, is always at hand to help visitors with anything they need – from directions to store promotions to the week’s best buys. Walking around with mobile devices, engaging shoppers on the go, the cheerleader’s ultimate goal is to cheer everyone up with personal touches – from handing out a balloon on a rainy day or a piece of chocolate on Valentine’s Day to taking selfies with shoppers and uploading them on the Lot 10 Facebook and Instagram platforms. For customers to stay even more connected in a digital environment, Lot 10 also announced that free WiFi is available across all five floors and launched a new Lot 10 app which features user-friendly touchpoints for customers – from access to a mall directory to updates on the latest promotions and sales from tenants, all of which make for a better experience for shoppers. The application is currently available on the Android platform while the iOS version will soon be available. Lot 10 began its 18-month transformation in June 2016 and is midway in its journey towards completing its fresh new look by the last quarter of 2017.